With this box we wanted to try something a little different ~ so we decided to send our Missionaries a Service Box of Love. Our box theme was based around the scripture Mosiah 4:15 which teaches us to Love One Another by doing Service For Another. Everything in this box was meant to be used in some way for our Missionaries to Serve Someone Else. They could decide how and whom to serve and Oh My it was so much fun to hear about all the crazy, silly, fun ways in which they came up with to use the items we included! And of course we threw in a few Valentine’s Day treats for them as well!!! ★ If you would like to send your own ‘Love One Another ~ Serve One Another’ care package – check out this kit we put together to help you do just that! Our Hearts Will Follow Where Our Eyes Cannot!!! It’s always so fun to see the pictures our missionaries send home of them opening up their crazy boxes decorated in whatever the theme of the box is and this was definitely a fun one! For this ‘Box’ we moms decided to do a Love One Another ~Serve One Another theme with each mom coming up with her own spin on it so it will be fun to see what they all come up with! When I think of Loving One Another – the first thing that comes to my mind is service. When you serve someone you forget yourself and whatever is troubling you and you just feel good. It helps to put things into perspective and makes your whole day just seem better. Sometimes I can remember running around like a chicken, just trying to get everything that needed to be done that day done – but the days that I specifically dedicated myself to doing service for someone made my days just better. Maybe everything didn’t get done, nor done the way I might have if I had had more time, but that was OK because I had served someone. The second thing that comes to my mind is attitude. The way we look at one another, treat one another, and how we serve others ultimately becomes a huge chunk of the person that we are to become. If we look at life and people and the opportunity to make a difference in this world in a positive way – our lives will be enriched and be more full. For quite a while now, as you have been on your mission, you have been serving others on a daily basis – and I am sure that you have seen a difference in your outlook upon the world. You seem just genuinely happy and always have a smile in your heart if not always on your face. I’m not saying that this takes away hard things, or that you haven’t had hard days, or won’t have harder days, or that troubles will not find you – but it does seem to make those troubles less hard as we think about and serve others. Ultimately we are all on a mission of sorts – we came to this earth to gain a body, hopefully make good choices, and to someday return to live with our Heavenly Father. Along this journey I hope we never forget that it is our privilege to meet and to serve our fellow brothers and sisters. I read a couple of really touching poems and stories that each touch on the Worth of Souls in slightly different ways and I wanted to share those with you here. gain is not worth the price of one’s soul! one day. “What is it’s worth upon the earth? me a set of scales, in perfect balance, there. different treasures of the world, he quietly placed them there. for on the other side of that great scale, I saw one single man. I recognized a man I’d often seen. “His soul cannot be purchased with the wealth you’ve seen today. you’ll just have compassion, then you’ll share your brother’s pain. beyond his many faults and know, I’ll set him free. price upon the cross, to set this whole world free. Well little one I hope you have loved these stories as I did. They each made me want to try and do better. Just as the sun rises in the morning and the day is new – I will try and rise and do better each day. Trying to remember to find joy in service, even on the busiest of days, because it is all about the one. When we see the effect one person can have on the lives of so many, it perhaps is no wonder that the Lord reminded us, “Remember the worth of souls is great in the sight of God” (D&C 18:10). Love You To The Moon & Back Again! Depending on the size of the box you are sending – you could include or delete any of the following items – or come up with a few of your own. Missionaries are all about service – but we tried to come up with a few fun and new ways that they could Serve One Another! to help them find the way. Ensign July 2011 Talk: ‘As I Have Loved You’ by Barbara Thompson Second Councilor in the Relief Society General Presidency. Ensign August 1990 Talk: ‘No One Is A Foreigner’ by Giles H. Florence, Jr. Associate Editor. Ensign April 1987 Talk” ‘Faith With a Southern Accent’ by Giles H. Florence, Jr. Associate Editor. General Conference April 1999 Talk: ‘True Followers’ by Robert J. Whetten Of the Seventy. General Conference October 1978 Talk: ‘The Joy of Serving a Mission’ by Elder LeGrand Richards. New Era January 1973 Talk: ‘The Current Bush’ by Elder Hugh B. Brown of the Council of the Twelve Apostles. General Conference October 2014 Talk: ‘Rescue in Unity’ by Elder Chi Hong (Sam) Wong Of the Seventy. 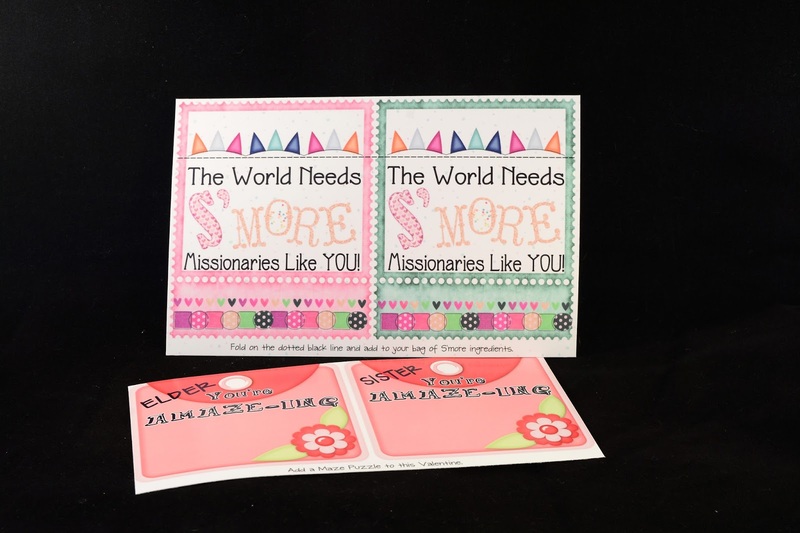 * Pack of ‘Thank You’ note cards with a tag for the missionary asking them to write Thank You notes to their Zone Leaders, District Leaders, Companion, Mission President, Dinner Appointments, etc. * Mustard Seed Bookmark “…The Kingdom of Heaven is like to a grain of mustard seed… Which indeed is the least of all seeds: but when it is grown it is the greatest among the herbs, and becometh a tree…” Matthew 13:31-32 Other scriptures regarding seeds: Matthew 13:1-8, 18-23, and Alma 32:26-43. * Tag ‘As we lose ourselves in the service of others we discover our own lives and our own happiness’. * ‘I am ready now’ notebook. (Deseret Book) Add quotes & Thoughts to it. * Post-It notes and pen – Tag ‘Leave little notes of encouragement, compliments, or just to make someone smile. Leave the notes on mirrors, cars, bikes, books….be creative! * ‘I Love You’ wooden plaque. * Tube Sock (One sock is inside the other sock) filled with toiletries and a snack. Write a positive, uplifting note on the postcard enclosed. Keep in the glove box or in your backpack and when you see someone who is in need give it to them. and what it had to say. if your heart is right indeed. is only good for you. There is ALWAYS fun holiday Missionary attire to be found at the Dollar Tree Store! Especially the scarves and ties for only $1.00!